There are two theories about eyespots on lepidopteran wings. The first is that large conspicuous eyespots can startle or intimidate predators into not attacking, or at least deter them long enough for the insect to make an escape. The other theory, is that they deflect the point of attack, e.g. a peck, away from the vital parts of the insect. There’s no reason why they could not act in both ways I suppose. 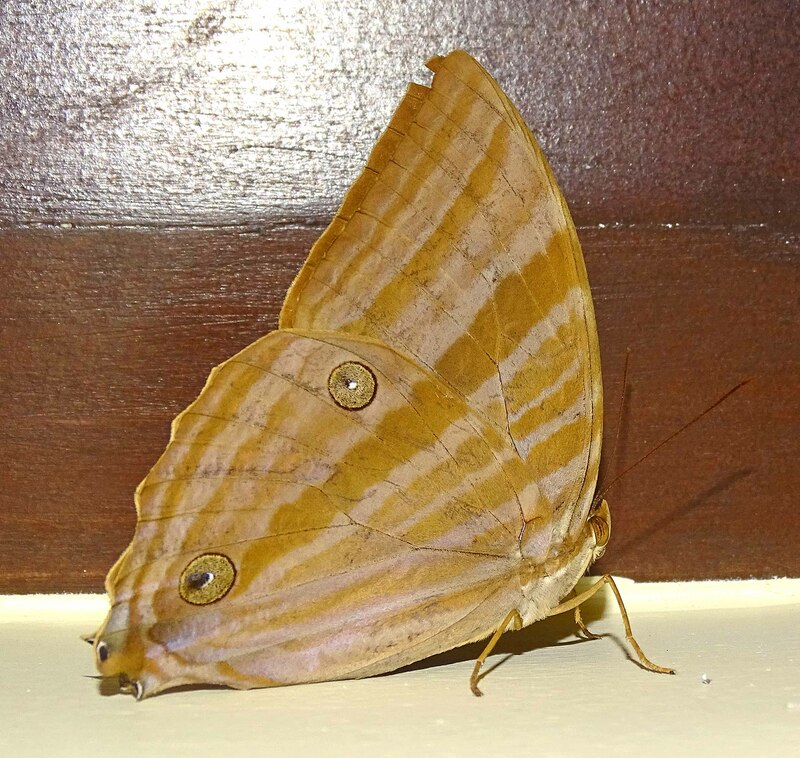 One night in April 2016, when I was in Sabang on the island of Palawan in the Philippines, I noticed a number of Palmking butterflies of the local subspecies (Amathusia phidippus palawanus). The next morning I came across a rather battered specimen (below) that had clearly had a run in with a predator of some kind, probably a bird. What stuck me about this butterfly was that it had been pecked right on the eyespot, or ocelli. There are two submarginal ocelli on the underside of the hindwings, and the distal one – situated the furthest away from the centre of the body – had been cut through by damage, presumably a peck of some sort. This photograph (above) also clearly shows the feature at the end of the hind wing – the tornus – with two small black spots, that look rather like eyes. See also photos on website 3, below. These do look a bit like a tiny head, or nose (‘snout’ ) which might fool predators into thinking that this is the business end. Butterflies which are damaged in this way – see also previous blog called ‘Peck me here’ (2) – are unlikely to be unduly affected; they will still be able to fly and hopefully mate. In this case the deflection seems to have worked. I am not the first person by any means to have noticed or recorded this phenomenon. A similar photo of a ‘Palm King Amathusia phidippus (showing bird attack evidence of rear false eye)’ is shown on the interesting Spineless Wonders site (1). 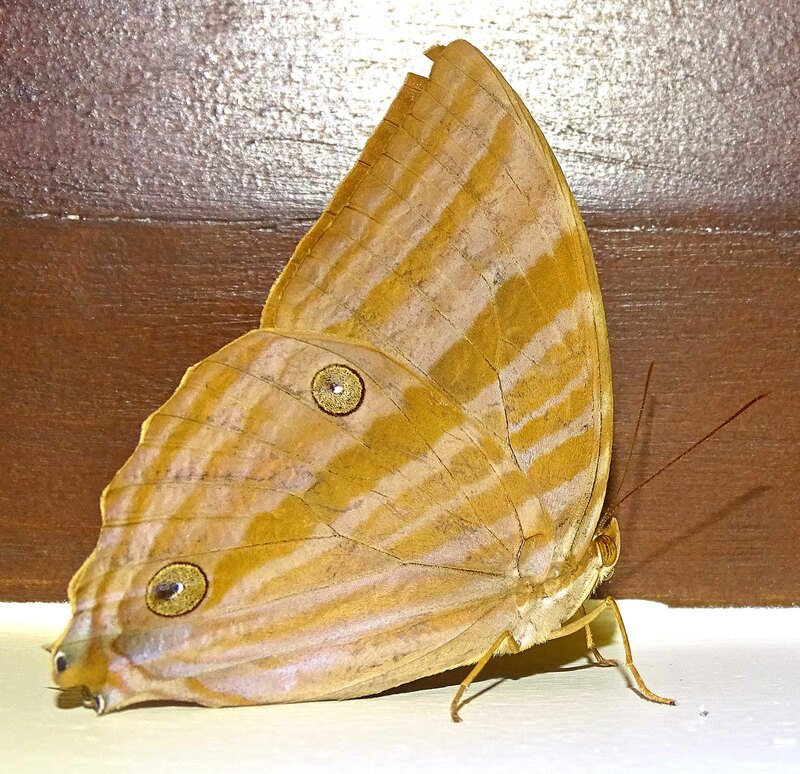 For more details about the biology of this species, refer to the excellent Butterflies of Singapore website (3). Ray Cannon's nature notes Eyespots as deflection devices?